Shinzo Abe’s long-awaited trip to China brought a raft of deals, but no major breakthroughs. The leaders of Asia’s two biggest economies reached a series of agreements on Friday aimed at deepening economic and trade ties between China and Japan. 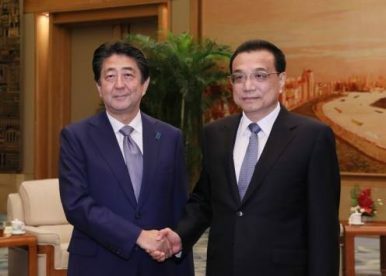 Japanese Prime Minister Shinzo Abe – making the first official visit to China by a Japanese leader in seven years – and Chinese Premier Li Keqiang both spoke glowingly about the recent improvement in long-strained bilateral relations and vowed to continue to build on that progress. The agreements announced in Beijing include a three-year currency swap agreement of up to 3.4 trillion yen ($30.4 billion). The deal was designed to enhance the financial stability of the two countries, the Bank of Japan said in a statement. In a separate announcement, China and Japan pledged to increase their cooperation in the area of innovation. Abe is also reported to have proposed the establishment of a “development cooperation dialogue” to oversee joint infrastructure projects in other countries. The Japan Bank for International Cooperation and the China Development Bank will also launch a scheme to jointly finance infrastructure projects in third countries, Kyodo News reported. These steps, while paving the way for joint development projects, appear to fall short of a full embrace of Chinese President Xi Jinping’s signature Belt and Road Initiative. It follows Japan’s previously foreshadowed decision to stop providing China with official development assistance, which Abe argued had “completed its historical mission” over the past 40 years. China is now the world’s second largest economy and Japan the third. Both leaders stressed the importance of free trade. Abe’s visit comes amid turbulence in the global economy, with the United States and China involved in an increasingly tense trade dispute. Abe and Li backed the acceleration of talks on a three-way free trade agreement with South Korea, and also the Regional Comprehensive Economic Partnership (RCEP). These were the same trade negotiations highlighted during the trilateral summit that Abe hosted in Tokyo in May. Later in the day, Abe and Li attended an economic forum where companies from both countries signed agreements to push forward with about 50 projects, including development of an energy efficient smart city in Thailand and an offshore wind power project in Germany, Kyodo reported. At the forum, Abe took the opportunity to once again emphasize the need to follow international standards for infrastructure projects and to take into account the financial position of recipient countries. Abe also met on Friday with Xi, who argued stable development of the relationship between Tokyo and Beijing was an important goal, especially at a time when instability and uncertainty was growing around the world. Abe’s three-day visit reflects growing attempts by both sides to improve relations, which have previously come under strain over wartime history and the territorial dispute over Japanese-controlled islets in the East China Sea (known as the Senkakus in Japan and Diaoyus in China). This year is the 40th anniversary of the signing of the Treaty of Peace and Friendship between Japan and China. Abe’s official visit is described as the first of its kind since late 2011, although he has made several trips to China to attend international gatherings in the meantime. One notable area of tension was in the area of human rights. In an apparent reference to the plight of the Uyghur minority, Abe told Li that Japan and the international community were “paying close attention to the human rights situation in China,” according to a Japanese government official who briefed reporters. It is unclear what response Abe received. However, the leaders made progress in other areas. Abe secured a commitment by China to review its ban on imports of Japanese food products, which had been driven by concerns about the 2011 Fukushima nuclear disaster. Meanwhile, both countries agreed to cooperate on search and rescue operations and also on efforts to resolve the North Korea nuclear issue. Last but not least, there was a symbolic agreement on the loan of a giant panda to a Japanese zoo. As expected, Abe invited Xi to visit Japan in coming months. This trip is likely to occur in conjunction with the G20 summit to be held in Osaka in June next year.